I love costume jewellery in summer! How pretty! I really like those delicate earrings, the vine-ish ones. That's a lovely selection, Kellie! I'm in serious love with cocktail rings. I've decided to stay that way whether fashionable or otherwise. Costume jewellery is great for summer and I have a lot of it. So thanks for the reminder to go through it and find some good pieces to brighten up my outfits. Nothing wrong with a little flutter....gorgeous pieces Kellie, xv. Gorgeous selection, these pieces are fab! This bracelet is wonderful. I want one! Such fun selections -- I'm especially loving the feathered hoops! Oh I love the very first one on top to the left.Looks like pearls and some black velvet ribbon Very nice.I love pearls and ribbon with it makes them all the more pretty. Oh I just clicked on an old blog of yours titled my kind of candy cane.Oh my how pretty looking.Soft and pastels to cute! 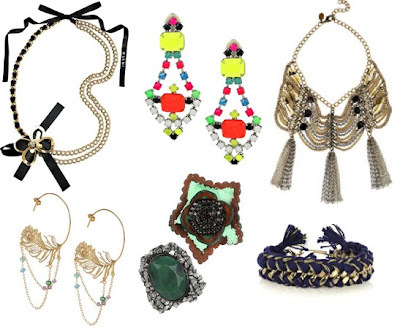 I adore costume jewelry but feel far too intimidated to wear it :) The pieces you've selected are stunning! Oh wow, these are beautiful pieces! Have a wonderful weekend! 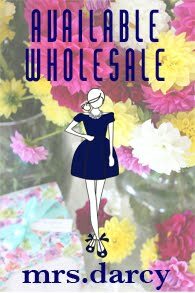 I'm Kellie Collis and Ada & Darcy is a place I share my thoughts, interests and happenings at my store and my life. I love to decorate, love beautiful textiles, love bright colours and love to share the bits and bobs that inspire me each day. With lots and lots planned over the coming months @ Ada & Darcy, I hope you enjoy visiting as much as i enjoy sharing gorgeous things i find along my adventures.